Welcome to Mrs Robinson's class. I'd like to introduce myself, formally known as Miss Crossdale, I got married this summer and have now become Mrs Robinson. I have been teaching at Padiham Primary School for 5 years since I was an NQT and have worked in Year 4 for the same length of time. I enjoy creative learning and try to make learning as much fun as possible. I am also the PSHE co-ordinator in school and we are currently on track to achieve some healthy schools awards. This half term we are going to be learning lots of new and exciting things, we will be learning all about the Stone Ages. We are currently reading a story about a little cave boy, who enjoys inventing different things and we hope to write our own exciting caveman story. In science we are looking at rocks and soils and thinking about how different rocks are formed. During our art lessons we are enjoying drawing our very own cavemen. We are also enjoying reading 'Charlie and the chocolate factory' by Roald Dahl and have even invented our own Wonka bars. If you want to find out more about what we are doing this term please look at our curriculum clouds or come and speak to me, I will be happy to inform you of the exciting things that we are doing. PE is on a Wednesday so don't forget your kit. Mr Rigg will be joining us this year for some extra special music lessons. Swimming is on Friday so don't forget your kit. On Monday 9th March a crime was committed in 4C, a terrible person stole all our sweets from the treasure box in our classroom. With the help of 3S and 3/4R we started an investigation into who could have committed this crime. We had a few suspects, who included Mr Dunderdale, Mrs Knightley, Miss Ruston, Mrs Billiam, Mr Leyland and Miss Starkie. All these people were seen around the treasure box at the time of the crime. After a few weeks of investigating and questioning we noticed a clue on the treasure box, the criminal had returned to the scene of the crime and left a black scarf. We then realised that the scarf belonged to Mrs Knightley and she confessed to taking our sweets. On Monday 23rd March the police came in to see Mrs Knightley and to deal with this crime. After lots of thought they decided to let her off with a caution because we realised she had made a big mistake. While the PC Horner was here she told us all about the police and what they do and we even got to look at her car and here the sirens. We would like to say a big thank you to PC Horner for taking time to come and show us all these exciting things. Don't worry though, Mrs Robinson told us that it was all a big fib and Mrs Knightley didn't really steal any sweets, but we had a great time. We are now going to use all this information to write our own recount of all the main events. We had a great time during book week and we even got to dress up as pirates. We wrote our own stories based on the book 'Captain Flinn and the Pirate Dinosaurs' by Giles Andreae and Russell Ayto and pretended to fight lots of different pirates. For our Mother's Day cards this year we decided to have a go at some Origami (the art of paper folding). For 3 weeks we have had a gymnastics coach in school. She has taught us lots of things like differerent ways to balance and travel as well as how to be safe of the equipment. 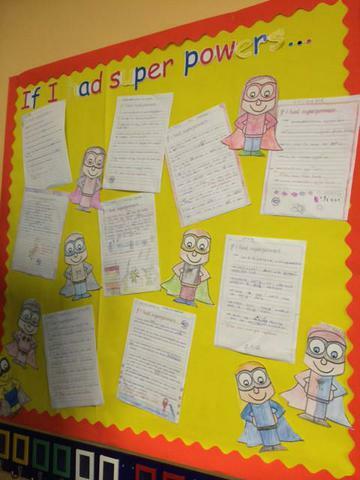 Here is our display on superheroes. We had to write some poems about what we would do if we have superpowers. We came up with loads of exciting ideas.